The inside of the Chuta Suna [Chota Sona] Masjid, or small Golden Mosque. bl.uk > Online Gallery Home	> Online exhibitions	> Asia, Pacific and Africa Collections	> The inside of the Chuta Suna [Chota Sona] Masjid, or small Golden Mosque. 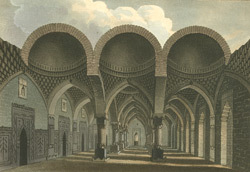 Coloured aquatint from a painting by Henry Creighton, engraved by Thomas Metland, and dated to 1817. Also known as the Gem of Gaur (c.1493-1519) this mosque displays carved stone panels of intricate design formed from the fine black basalt of the nearby Rajmahal hills. The central corridor has typical Bengali 'chahar chala' vaulting flanked by two domed bays to either side. The sanctuary has five recessed prayer niches or 'mihrabs' that correspond to these five bays and is three aisles in depth.